Usain Bolt “was really cold” before pulling up with injury in his last championship final, according to his Jamaican relay team-mates. 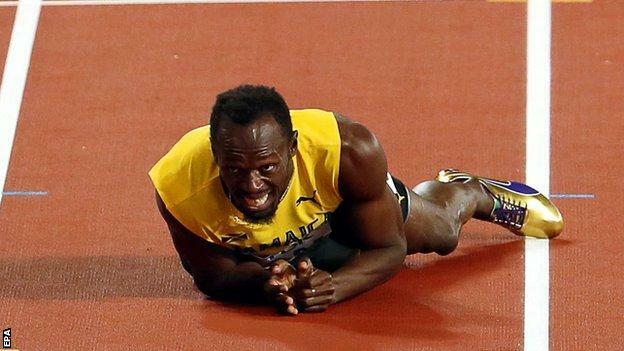 Bolt’s London finale ended in disappointment as he suffered a muscle cramp before the end of the 4x100m relay final, which was won by Great Britain. 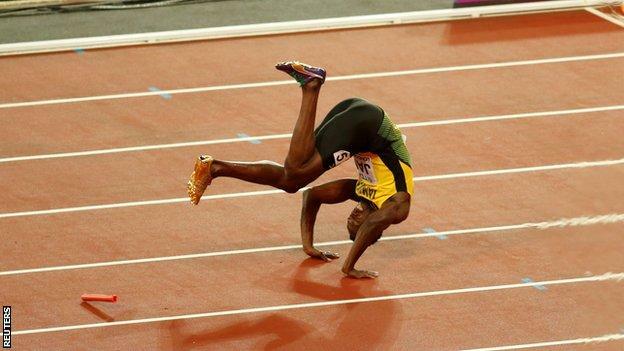 Yohan Blake, who ran the third leg, said: “The race was 10 minutes late, we were kept 40 minutes. It was crazy. Bolt had hoped to bring an end to his career with another two gold medals in London but leaves with only a bronze from last weekend’s 100m. And, seconds after taking the baton for Jamaica’s anchor leg, he pulled up and tumbled to the floor with Dr Kevin Jones, Jamaica’s team doctor, confirming Bolt had cramp in his left hamstring. “It was 40 minutes and two medal presentations before our run,” added 2011 world 100m champion Blake. “We keep warming up and waiting, then warming up and waiting. I think it got the better of us. Omar McLeod, the 110m hurdle champion who led out the Jamaican team, echoed the criticism of delays at the start of the final. Mo Farah’s lap of honour after his second place in the 5,000m final seemed to delay the schedule, with the event’s medal ceremony also taking place before the relay final. “It’s heart-wrenching,” he said. “I gave it my all and I really wanted Usain to leave golden, or even if it was just a medal. “It was ridiculous, man. We waited a really long time. I drank two bottles of water. Justin Gatlin, the 100m champion, called Bolt “still the best in the world” after taking silver with the United States, and also felt that the weather may have played a part in Bolt’s injury. “I think it was the elements,” he said. “I’m sorry he got this injury. “I think it was just one season too many,” said four-time Olympic champion and BBC Sport pundit Michael Johnson of Bolt. “I think Bolt was prepared to not win but I don’t think he would have expected his last race to end like that. He would have wanted to cross the finish line. Darren Campbell, who won 4x100m Olympic relay gold with Britain in 2004, believes that Bolt’s impact off the track is almost as hard to replace as his skill and records on it. Bolt’s charisma, charm and character have made him one of the most recognisable and marketable people on the planet. “Any stadium that Usain Bolt decides to grace ends up being full, that tells you all you need to know,” Campbell said. “What we are witnessing is so powerful, so inspirational, he can’t be replaced. How do you replace him – as a sports star and a human being? “Usain Bolt treats you the same whether you are a dignitary or the poorest man in the world. That’s a unique skill.